Dogs will guard their homes or territories by nature. In the wild when an intruder comes too close, one dog within the family group will give a warning bark to alarm the others of the intrusion. We cannot expect our dogs to behave in a different manner in their human families. 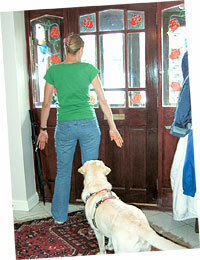 Often when a visitor comes to the door, our dog will give a warning or guarding bark to alert us to the visitor. Here’s how you can teach your dogs to be calm around visitors. A warning bark sounds like a high frequency and a little hysterical. This bark may be constant or a series of small barks with short breaks. A guarding bark sounds like: Grrrrrrr – bark, bark – Grrrrrrr. Depending on how defensive the dog is, warning bark depends on the amount of growling. The bark may also be a deeper bark than usual. Whether the barking is a warning or a guarding bark, your dog will have a high level of arousal, excitement or fear. You may see your dog react by lunging forward, spinning around, barking, jumping up your visitors or yourself, growling, running around, or she may be reacting with all of these behaviours. Because of the high level of excitement, arousal or fear involved, your dog will also have a high level of stress. This causes the muscles to become full of adrenalin and will become active. This is why it is not possible for your dog to keep still. Giving your dog something to hold in his mouth, such as a toy or blanket, can help your dog cope with the situation. You may like to try the following task firstly with regular visitors whom you and your dog know, then build up to visitors your dog does not know very well and then with strangers. When a visitor comes to your door and your dog gives a warning/guarding bark, tell your dog ‘thank you for telling me’, do not touch your dog, just go to the door and stand between the door and your dog (as the photo above). Absolutely do not talk to your dog, look at your dog or touch your dog at this stage. Any verbal, physical or visual contact this time will reward the dog for continuing to bark and increase the behaviour. Open the door slightly and tell your visitor that you are training your dog and what you want him to do once you let him in. If your dog begins to bark once you open the door slightly, close it again making sure your body is positioned between the door and your dog. Open the door again slightly, if dog barks again, close the door, if dog does not bark at all, open the door a little more. Build this up opening further if the dog does not bark and closing it if the dog barks until you are able to open the door completely and let your visitor into the house. Ask your visitor when he comes in just to say a quick hello to your dog, so your dog knows the visitor has acknowledged her and then to ignore your dog until she is settled and calm. Once your visitor has come into the house, give your dog something she can carry around or chew (your dog cannot bark easily with something in her mouth). This will help her to settle and calm down. You may need to place your dog on a leash the first few times your visitors come to help her cope, then unclip the leash once your dog has settled and calmed down beside you with a chew or a toy. If your dog approaches your visitor in a nice calm way, invite your visitor to talk to and stroke your dog. If your dog does not approach your visitor, then do not allow your visitor to approach her. Give your dog the respect of having the choice in her own space to approach your visitor if she wants to. Do not start playing with your dog as this will only make her more excited and give your dog the association that when visitors come, it’s time for high levels of excitement. Dogs learn by association and if she associates visitors with the high level of excitement, she will anticipate that excitement the moment there is a knock at your door, and as a consequence may never learn to be calm around visitors. This is quite an easy task so long as owner, visitors and dog follow these instructions and work together. (Nicole Mackie has over 14 years of experience in handling, exhibiting, training, observing, studying and sharing her life with dogs, gaining many qualifications such as canine behaviour, canine psychology, general animal science and experience veterinary nursing. She is a radio speaker and writer for magazines, works with behavioural problems in dogs and runs socialising groups for dogs with social problems.